The ruins of a large pyramid like structure. Most of the lower parts of the structure have been reconstructed with continuing efforts to rebuild the entire temple complex. If you're into history at all, you have to see this place. 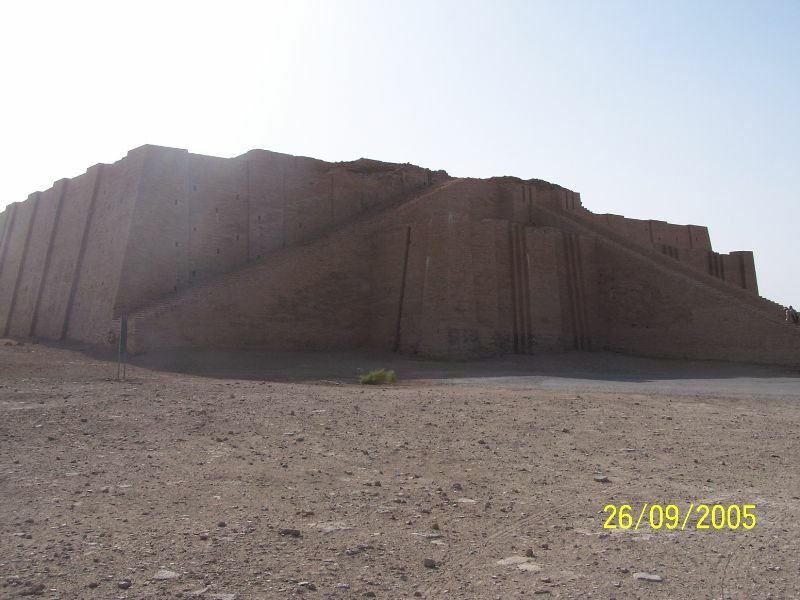 One of the most intriguing monuments still standing in Iraq is the Ziggurat at Ur. A ziggurat is a colossal stepped platform; and it is thought that ziggurats supported temples at their tops. These ziggurats were built during the third millennium B.C. Archaeologists don’t know for certain what the purpose of these ziggurats was; however, it is speculated that they had some connection with religion. There are several ziggurats visible throughout Iraq, the most famous of which is the ziggurat at Ur in the south of Iraq. Ur was an ancient Babylonian city said to be the birthplace of Prophet Ibrahim (Abraham), peace be upon him. It was established in the fourth millennium B.C. and eventually became the richest city in Mesopotamia. By 2100 B.C., the city came under the control of the king Ur-Nammu. Ur-Nammu built several ziggurats at Ur and other Mesopotamian cities. In the year 4000 B.C., temples were built on top of mud-brick platforms. As the years passed and new temples were built, the remains of preceding temples were used to expand the platforms under new temples. This was discovered by the excavation works of archaeologists who found different bricks from various eras in the foundation platforms, some of which were stamped with the names and titles of the kings who built the temple complexes. In this way, platforms grew with the construction of new temples. The ziggurat at Ur was built as a tribute to the God “Sin” and was called “Etemennigur,” which meant “a house whose foundation creates terror.” Excavation of the ziggurat took place under the direction of a British archaeologist named C. Leonard Woolley in 1923. Using information he recovered from ancient cuneiform texts, which carried descriptions of ziggurats, and after further excavations that led to the discovery of other parts of the temple complex, he envisaged what the original building looked like. What he envisaged was used by the Iraqi Department of Antiquities to reconstruct and restore the lower levels of the ziggurat. The core of the ziggurat at Ur was constructed using mud bricks which were then covered with baked bricks. The mud bricks were made out of mud and reed; the reed was pressed into moulds that had been left to dry in the sun. Each brick measured around 25 x 16 x 7 centimeters and weighed around 4.5 kilograms. The first stage of the ziggurat was built using around 7,000,000 mud bricks. On top of every sixth layer of bricks, reed matting was placed in a criss-cross manner. Sandy soil was also placed with the layer of reeds. This design was used to solve the problems caused by the dumping of silt from the Tigris and Euphrates Rivers during each flood season. The settling of this silt was to make building on it similar to building on quicksand. This manner of construction prevented the whole structure from drooping sideways when it became wet. The baked bricks, which measured about 30 x 30 x 7 cm and weighed up to 15 kg, were made out of clay pressed into moulds. The bricks were left to dry and were then baked in a mud oven using dry twigs which were set on fire. This made the bricks water resistant. In the first stage of the ziggurat around 720,000 baked bricks were used. Most of those bricks were stamped with the name and title of King Ur-Nammu. A large main staircase is found at the front of the ziggurat and goes all the way up to the temple, which is thought to have stood on the top terrace of the ziggurat. Two side staircases run up both sides of the ziggurat and meet each other, as well as the main staircase, at the gate. A support called a buttress was built on both sides of the main staircase. It is believed that the use of these staircases was restricted to temple priests. Each stage of the structure had a terrace covered with baked bricks. One of the most interesting things about the ziggurat is the so-called weeper hole. Weeper holes were small gaps that were left between the brickwork on the sides of the ziggurat. The purpose of such holes was to allow evaporation of water from the core of the structure. The weeper holes were lined with baked bricks. A vertical drain was built on either side of the ziggurat to carry away rainwater. The drains were also made using baked bricks. This location's validation is current. It was last validated by Emperor Wang on 12/23/2016 7:33 PM. This page was generated for you in 78 milliseconds. Since June 23, 2002, a total of 574102954 pages have been generated.